Where you are required to soundproof a house when converting it into a number of flats, for example a Victorian property. This is most likely to be the ideal choice for you. b) You are best to retain the existing lathe and plaster or plasterboard ceiling ( as this adds to the soundproofing of the solution). 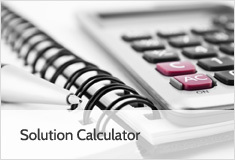 e) It is 1 hour fire proof- in common with all our solutions (building control often prefer substituting the 12.5 mm layer with a 12.5 mm fire check board). 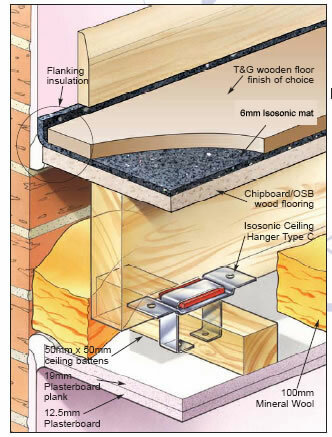 The ISOSONIC TIMBERFLOOR provides safeguards against failure with 'pre completion testing'. 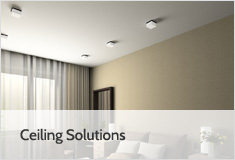 Ceiling Solution 1 - Isosonic Type C hangers System. A high performance, low cost and simple to install system. 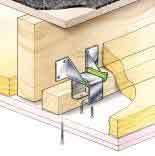 Provides a unique integral barrier to flanking sound transmission which is the predominant cause of test failures. ISOSONIC 6mm Mat is suitable for the direct application of timber and laminate floors without a board platform. Below shows a the cross section of ceiling left in place. The void between the old ceiling and new plasterboards is filled with our easy fit slab wool. a) The number of ceiling hangers required per square metre of floor will depend on the geometry of the room. 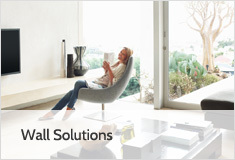 Regular rectangular rooms require approximately 2.5 hangers per square metre of floor area. b) Spacing of the ceiling hangers should not exceed 800mm. Isosonic Ceiling Hangers Boxes: 100 pieces per box. N.B. The Isosonic Timber Floor is not an official R.D. but has been tested to similar standards.